Through NetGalley, I received from Random House Children’s Book a copy of this book for the purposes of reading and reviewing it. Although it was provided to me at no cost, I am under no obligation to give it a positive review. This novel takes place in a post-World War III world, where “green bombs”, which are supposedly not as deadly as atomic bombs, have decimated the world. The remaining residue of the bombs have rendered all magnetic devices inoperable, and since most of the world was destroyed, the remaining clusters of people must start over from square one for the most part. Because of this, extreme value is placed on the ability to invent, and this process is crucial in the schooling of all children in the city and is encouraged among the adults too. Most of this story takes place in White Rock, a city located in a crater created by one of the bombs and named after the limestone mines surrounding the city. As the city is a crater with only one pass in and out, it’s very secure from the outside world. Add to that security a layer of dangerous gases above the city, named Bomb’s Breath, which is fatal to anyone who breaths while in that layer. This keeps attackers from coming over the top of the surrounding mountains, as they would never know the layer was there, and they and any other animals with them, would be killed instantly. Into this environment is thrown twelve year-old Hope Toriella. Her father died on their trek to White Rock and her mother died shortly after Hope’s birth. Hope is strong-willed, very athletic, determined, free-spirited and a natural leader. Oh and she can’t invent to save her life, making her the scorn of much of the city. This also affects her sense of self-worth. One of her skills, which she can only share with her best friends Aaren and Brock, is the ability to cliff dive through the Bomb’s Breath where timing of breathing is literally a matter of life and death. Naturally, if her adoptive parents found out about this hobby they wouldn’t react too kindly. Things are plugging along for White Rock until one winter, after the pass has been closed for the winter and many of the city’s young men have been sent to a neighboring city on the plains, one without mountains and a Bomb’s Breath to protect them. Bandits manage to find a way into White Rock and, after shooting in the leg Hope’s father, who had stood up as the town’s leader to protect the real elderly leader, demand all of the city’s antibiotics. Not only that, but the medicine must be created and delivered within two days or the bandits will kill most of the city. 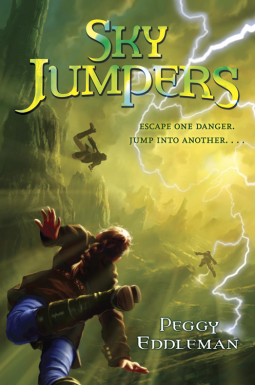 In order to save her father and the rest of the city, Hope, Brock, Aaren and, without their knowledge until it’s too late, Aaren’s five year-old sister Brenna, must make a trek through the Bomb’s Breath, to the top of the mountain, then back down the other side through the Bomb’s Breath again, all in an effort to get to the city where their guard is stationed. Their hope is to bring them back in order to repel the bandits and save the city. Oh yeah, this is in the middle of the worst blizzard in recent memory. Will they make it there and back in time? Can they manage the trek during the blizzard? How will a five year-old manage the trip when they don’t have enough snowshoes for everyone and the others must take turns carrying her? Can they know exactly where the Bomb’s Breath begin and ends while travelling during a blizzard? This story has plenty of drama and twists and turns, and I really enjoyed it. The Random House Children’s Books website says this book is for eight to twelve year-olds, and that feels about right. There’s very little outright violence, which is sanitized, and death is talked about as a possibility and in an after-the-fact sort of way. There are even slight hints at romance, but not too much considering the ages of the characters. Eddleman has solid character development for a first-time novelist, leading you to really care about the protagonists and despise the antagonists. This is the first book in this series, and I’m sure it will be successful, as will the follow-up books. When I read children’s or young adult books, something I really look for, especially as a parent, is whether or not the books teach as well as entertain. In that regard, Eddleman is very successful. In this post World War III world where electrical or magnetic devices are unusable and steel has been weakened by the green bombs, the residents must be creative in how they adapt and re-create what existed prior to WW III, often times in much different ways. This can be demonstrated in how they tackle refrigeration, clocks, antibiotics, farm tools, transport systems, and even a farm implement being re-purposed as a weapon such as a bola. I definitely recommend this book for children in the recommended age range. But I also believe it could be of interest to young adults and adults. This entry was tagged Children's Books, Fiction, Post-Apocalyptic Fiction, Review Request, Young Adult. Bookmark the permalink.